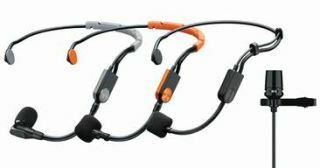 Shure Incorporated has extended its line of SM microphones with the introduction of two new headset microphones—the SM31FH Fitness Headset Condenser Microphone for fitness instructors and the SM35 Performance Headset Condenser Microphone for live sound applications. Shure SM31FH Fitness Headset Condenser Microphone. Shure has also unveiled the PGA31 Headset Condenser Microphone and the Centraverse Lavalier (CVL) Condenser Microphone, which are ideal for presentation applications. The SM35 Performance Headset Microphone offers multi-instrumentalists the freedom to express themselves during stage acts without having to sacrifice sound quality. Constructed to provide a secure, yet comfortable fit, the SM35 is appropriate for any stage—from small clubs to large arena tours. A staple addition to any multi-instrumentalist’s locker, the SM35 is offered for use with the BLX Wireless System, GLX-D Digital Wireless System, and ULX-D Digital Wireless System. Designed to meet the needs of fitness instructors, the SM31FH is a wearable, cardioid condenser microphone that features hydrophobic fabric, a material that repels moisture to protect and shield the microphone cartridge from corrosion caused by sweat. With a lightweight construction, secure fit, and low-profile form factor, the microphone is built to provide crystal-clear audio, even through extended hours of continuous use in fitness studios and gymnasiums. Available in neon orange, the SM31FH is offered for use with two of Shure’s newest and user-friendly wireless microphone systems: the BLX Wireless System and GLX-D Digital Wireless System. For vocalists who need the hands-free convenience of a wearable microphone, the new PGA31 headset is a versatile microphone that delivers pristine audio in a variety of settings—from general stage performances to more intimate speech applications. PGA31 is offered with the BLX Wireless System, PGXD Digital Wireless System, and GLX-D Digital Wireless System.